Planting Grant Missions: Digital tools for the "Modern Fishermen"
Home > Planting Grant Missions: Digital tools for the "Modern Fishermen"
Fr. Andre and parishioners join forces to minister to homeless.As a mission priest for the last three years, Priest Andre Paez, Rector of Saint John the Evangelist Mission here, states that his greatest joy has been helping people “come into Christ’s Church and participate in the mystery of His divine resurrected life. 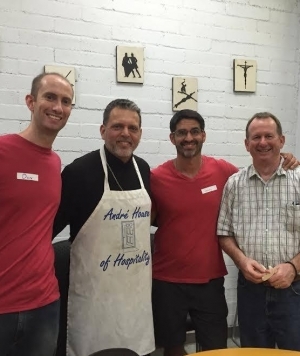 “As a ‘fisher of men,’ I am always looking for ways to accomplish this and help our mission grow,” said Father Andre, who enthusiastically shared some of the latest and most effective digital tools he employs in reaching out into the wider community. Father Andre adds that maintaining an up-to-date parish web site is also important. To help manage Saint John’s plethora of projects, Father Andre uses Asana.com , which is free for up to 15 people. Father Andre, whose mission is one of five which currently receive Church Planting Grants from the Orthodox Church in America, emphasizes that “having organized local church communities will empower the priest and the faithful to help newcomers get connected and acclimated to church life. Follow the growth of Saint John the Evangelist Mission at www.stjohnaz.org .